How to Fix Play Store RH-01 'Error Retrieving Information from Server'? Irritated by the Annoying Message “Error Retrieving Information from Server”. Just relax! We are here with a bunch of new and worked out solutions. Google Play stores 1.45+ Million content is always ready to be downloaded but many times you may face issues with your Google Store due to some technical glitch likely caused by either your network or software OS of your device model. These errors mostly cause problems downloading and installation. One Such major cause of the issue is an error in retrieving information from the server (RH-01). What Caused the Error RH-01? The error message may be deceiving and there is no issue with the server, the problem is with the device itself. The Older version of device model. Obsolete version of Play Store causing incompatibility with the device. 3rd Party App interfering with the store. 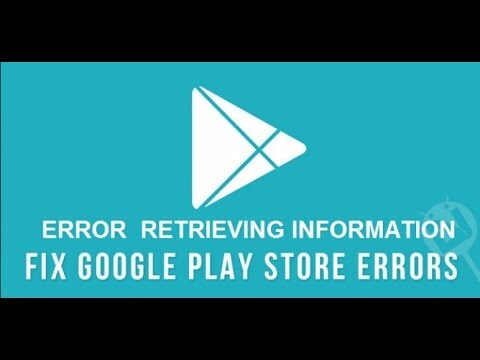 How to Fix Retrieving Information Error on Play Store? Solution Which You Might not have tried yet. The play store sometimes requires the device date to match with server dates or else error may occur. Look for Option named Date & time. Set the correct time or turn ON the Automatic date & time. Clear all tabs and check for the issue. Click on ‘Reset App Preferences’. Google Services Framework syncs your data and stores device data. It also helps in proper functioning of system apps. Especially if you use a device which uses varies Google Architectured apps, clearing the cache will help fix the problem. Reboot your device and you will see the RH-01 error will be solved. How to Fix 'Error Retrieving Information from Server' on Google Play Store? Safe mode lets you disable all 3rd party apps you installed for a temporary time. Your device will be in Safe Mode (A transparent logo of Safe Mode will appear on screen). Long press on power key as you do for turning off your device. Tap and press on power off option. You will see the option of Reboot to safe mode. Tap Ok to enter the safe mode. There may be many 3rd party apps installed on your device that has permission to access device info. These apps obstruct the normal functioning the play store thus causing the issues. If you are not facing any issue with Google Store in safe mode than some 3rd app is causing the Store to dysfunction. Uninstall recently downloaded app if any or reboot directly back to normal mode to solve the issue. Note:. Just reboot again to restore and come back to normal mode. Tap it and Force stop the Google Play Store. Clear data and clear cache followed by a quick reboot. Go to Settings > Accounts. You can even upgrade or downgrade your Google Play Store and check for the error fix. For info on how to upgrade your Google Play Store, you can check this blog post. If none of the above works then you have to settle for last resort. If above methods are not effective enough then resetting your device can solve the problem by deleting all junk, malicious files and bugs which may cause the problem. Your device will come back to default state thus issue is solved. Note & Conclusion: I hope the post was helpful. Do comment for any assistance or suggestions. If you've any thoughts on Fix – Play Store “Error Retrieving Information From Server” [RH-01], then feel free to drop in below comment box.